Let’s talk about the men in our lives. I’m ashamed to admit that I have many times defaulted to the food gift for my father and various other dudes. It’s not for lack of trying to do something nice. It’s just that guys are so dang hard to shop for! In my experience, they either have what they want or don’t know what they want. For this reason, I’ve made it my mission in life to decode my menfolk and do better than Hickory Farms and dark chocolate. (not that there’s anything wrong with that). This year I’ve come up with a few gifts I would be proud to give! Let me know guys, am I on the right track? What do YOU want for Christmas? Click each slideshow picture to view the next one. Nerd-Herder Wallet: I got this for my husband last year and he used it for months. He goes back and forth between wallets but it was a big hit and Great to throw in his work bag. I love that it has little spots for extras like a guitar pick. Shop styles on Rockitbot $32. ChromeBook: It’s a computer! It’s a tablet! It’s a chromebook! If your guy is hooked on Google Chrome, this is an awesome little gadget. Think of it as a tablet (apps only) but in laptop form for those people who just really dig keyboards. It’s more or less internet-only so don’t think you’ll be saving a bunch of photos on there. Then again, that’s what mom’s computer is for amirite? Tiger Direct has them starting at $199. Converse: You can never have too many Chucks in my opinion. I love this “menswear” style because of course I do. If you really want to get fancy, you could even design your own. The ones in the photo are $55 at Converse. Whiskey Stones: I feel like I am the last person to hear about these little rocks, but they are awesome! Made of soapstone, you just chill them in the freezer and use them in a drink instead of ice cubes. You know, so it doesn’t get watered down. Genius! This particular brand is called Spirit Stones, which I refuse to say unless I am doing Jazz hands. $12 at Amazon. Evernote Smart Notebook: Holy cow you guys, two of my favorite things got married and had the coolest baby ever! I am over the moon about the Evernote app since you can sync just about everything over all of your devices at once. I’ve been using it to take notes at blog conferences, share pdfs with myself and group together with other bloggers to get the most out of sessions I am not able to attend. And now? Moleskine has created a SMART notebook that works with the Evernote Page Cam. So you write or draw something, snap a photo with the Evernote camera app and it makes your drawing digital! Use the special stickers to send your pic straight to a certain folder too! Forget the guys. I want this. The camera app is only on iPhone and iPad for now, but don’t worry, the Android version is in the works. Get your notebook for $24.95 from Moleskine. Personal Trimmer: This is the ONE thing Jerry suggested when I asked him what I should add to my gift guide. I said, REALLY? That? He said, Sure. We’re hairy. So there you go. This set from Wahl has a lot of different attachments so you can trim up your hipster beard and make sure your eyebrows aren’t longer than your eyelashes. Score! $24.95 on Amazon. Messenger Bag: Sometimes a Dad needs a man-bag. Or a Murse. Or as my husband calls it, a purse. Face it. Dads carry stuff. Might as well look good doing it. I like this bag from Rothco for $44.50. Sports Channel Extras: This one doesn’t have an image but once we got cable we started noticing the extra goodies you can add on. Of course we don’t want to go crazy with this because that mess can get expensive. That said, Jerry added on the FUEL channel earlier this year to watch the UFC fights and he loves it! If we didn’t already have that, I would totally get it for him. Check with your cable/dish company to see what’s out there. 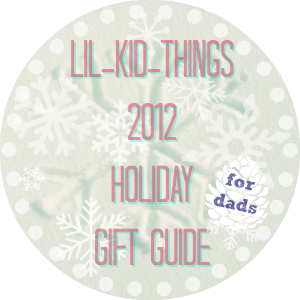 Something silly: Looking for those funny/quirky gifts to make him laugh? How to be a Dad has you covered! OK dads, tell me. Would you like these things? It might sound gross, but my brother in law takes several trips to the restroom on an average day and often needs something to read. Every year I buy him a bathroom reader. he loves it. I think its gross. LOL. Also, you gave me a great idea for a homemade gift. Buying a growler and cold brewing coffee for my coffee fiend friends! love it! I have been wanting one of the evernote moleskin journals since I read about them a few months ago. And that wallet–so cool! Lol, your husband and my husband are complete opposites. I guess this guide is good for ideas for my BIL. [WORDPRESS HASHCASH] The comment’s server IP (67.205.62.185) doesn’t match the comment’s URL host IP (69.163.161.205) and so is spam.